Sorry we’ve been such neglectful bloggers. We have been Internet free (thanks to country living and the sleazy Hughes.net) for over a month now, which isn’t all bad. But we have missed you all! And so to make it up to you, we promise to blog something every day this week, even if we have to type it all with our thumbs. And if that’s not enough, we are having a book give away! 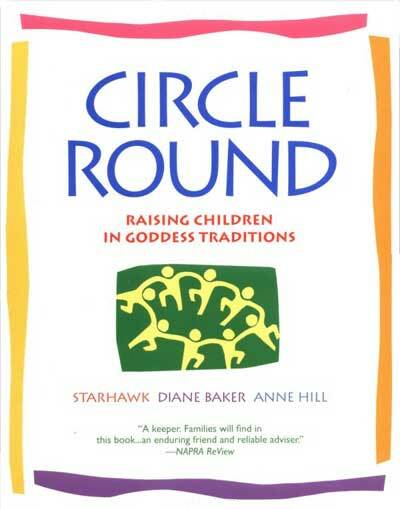 Circle Round: Raising Children in Goddess Tradition by Starhawk, Anne Hill and Diane Baker is a treasure trove of ritual, story, seasonal activities and advice. Our family reads from it at every Sabbat and uses it often as a reference and for inspiration. To enter the drawing, you must do two things. Sign up to “follow us by email” (if you already have, just let us know, and thank you!) AND leave us a comment sharing your plans for Samhain. We will randomly choose a winner, this Sunday, at 5:00. I have this already so dont pick me. We are going to Nels and Judy's Samhain in Wisconsin this year! I am thrilled as I haven't been there. Travis has been there a few times before. We will only have Grace with us though so that's a little sad. Miss you guys!! Subscribed already, but in Google Reader right along with all the other blogs I like to read. It's more organized and easier to keep track of that way. :0) We're going to be doing the usual things including a few Dia de los Muertos inspired activities/crafts (sugar skulls, pan de muerto, etc). I think we'll also have a small family ritual/dinner on Nov 1st. I haven't quite figured out how I want to tackle our ancestor altar, though. We're new Pagans so it's all a work in progress. We're going to Nels & Judy's as well. I LOVE going there. It's wonderful and moving to be there. We're following you too (you can follow us at mainstreethomestead.blogspot.com). Well, we were going to go to Ozark Avalon for their Samhain celebration, but Chryssi was cast in the school play, and their final dress rehersal is that same weekend. We will likely just set up or annual ancestor fire, and write note to those who have passed, sending the messages up in the flames, and, of course, leave a place at the dinner table for anyone who stops by to check in. I don't have any solid plans as of now. I am hoping I can find some friends to celebrate with. Most Samhains, I celebrate solitary. I have attended The Triple Goddess Celebration @ Ozark Avalon and it was a good time! For Samhain this year I'm going to a group ritual with my CUUPs group and carving pumpkins like it's my job! Thank you for all your comments. We used to have a local CUPPS chapter that I really enjoyed. In fact, it played a romantic part in my courtship with Christopher. And how jealous I am of those of you going to Nels and Judy's! Someday I will too! And you can still win the book if you already own it- it would make a great gift for a new Pagan family. Since my family and I practice mostly Solitary we will probably just do a family ritual in the back yard. I've signed up for email updates. For Samhain this year, my husband, daughter and I will be spending a fun evening together in the back yard. Then a quiet family ritual to honor the ancestors and those that have passed on. I'm signing up to follow by mail. Lol…we're not pagans but Celtic Christian, which celebrates also celebrates the Sabbats and Esbats, unlike most every other denom so I like having pagan references around to adapt. Oddly I missed this one! Subscribed! 🙂 We will be making a new wreath for our front door, adorned with nature walk finds. Prodea is seeking the bone lady this year, outdoors . . . I plan on celebrating Samhain quietly at home alone. It's what I do every year. 🙂 Thanks for this cool giveaway! Not sure what time zone you are in but just in case!! THis will be my 1st one so still making plans! !